Step 1. Check your location. While Argentine ants can arrive almost everywhere in the world with human commerce, their survival outside of warm regions is low. If you live in North Dakota, for example, the chance that the ant you just collected is an Argentine Ant is pretty slim. On the other hand, if you live in coastal California, Chile, or Portugal you’ll be hard-pressed to find any urban ant that’s not an Argentine ant. The map above is a rough indication of places where Argentine ants are most frequently encountered. Outside of the occasional greenhouse, the other 20 species of Linepithema generally do not travel around the world. If you are not in South America, Central America, or the Caribbean, then any Linepithema species you see will almost certainly be an Argentine Ant. Only in the Neotropics, where the Argentine ant co-occurs with some frustratingly similar relatives, does identification to species become tricky. Step 2: Make sure you have the right genus. You’ll need a microscope for this and all subsequent steps. All Linepithema species share a distinct pattern of teeth on their mandibles and an unusual shape to the clypeus, that bit of exoskeleton that forms the front margin of the head. If your ant shares the combination of a clypeus that is broadly concave in the center (as shown by the smooth red line in the photo above) and mandibular teeth that are arranged as a series of small denticles interspersed with larger single teeth (shown by the jagged red line), then you have a Linepithema species. Outside of Central and South America, your ant will likely be L. humile, the Argentine ant. Step 3. Check to see that your Linepithema is relatively hairless. So you have a Linepithema. How do you know that it is L. humile? Check the hairs. Linepithema humile is among the least hairy species in the genus. It lacks standing hairs on the dorsal surface of the mesosoma and on the first two segments of the gaster. These hairs can be subtle, so you’ll need to check carefully with the right lighting. In L. humile you won’t see any standing hairs until the third gastric segment. Any ant that has standing hairs on the first two dorsal segments of the gaster will be a different species. Step 4. Check to see that your Linepithema has large eyes. The final check to confirm an identification is to look at the eyes. By a slim margin the Argentine ant has the largest eyes of any Linepithema, containing more than 90 ommatidia. Counting ommatidia is tedious, so I find it easier to just get a sense for what a larger eye looks like. This takes a bit of practice. The above photo contrasts the Argentine ant (at right) with its relative L. gallardoi. It’s not a huge difference, but it turns out to be consistent. You’ll also notice from the photo that the Argentine ant has a longer first antennal segment than L. gallardoi. 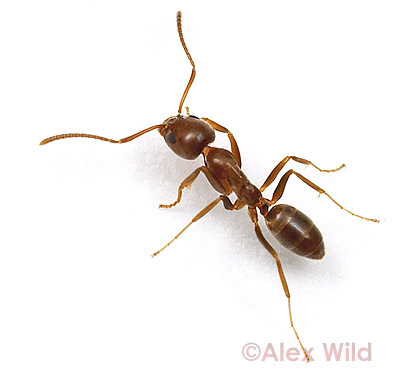 The long antennae of the Argentine ant is a helpful trait, but only to a point. There are a few other species that also have long antennae, so it is still best to check for the standing hairs and the large eyes. See how easy that was? Just kidding. Separating Argentine ants from closely-related species is challenging, even for me. If you need more information, the two papers I’ve written on the taxonomy of Linepithema are linked below. These papers provide additional characters, as well as information on identifying the other Linepithema species. Specimen images courtesy of April Nobile at www.antweb.org. Hey Alex: Argies have disappeared from my neighborhood in Davis California. Is there any literature on this sort of thing? It is fascinating and wonderful for our citrus. no chance these guys have anything to do with the honeybee collapse? Hi Ed. Unlikely. Last I heard, CCD was a most likely a disease of some sort. For the truly uninformed, can you tell us how to tell this species from the fire ant (Solenopsis)? These guys seem to have another destructive trait; their attraction to outdoor electronics. They get into the parts and short them out. I am finding out a lot about these pests; and it has been a very expensive lesson! Has anyone done any work on these ants as a food source or dietary supplement? I’ve been looking for an ant expert, and ended up getting here through a series of links from the Ohio State web site. I live in Cleveland, Ohio. I had a swarm of ants in my yard today. They were brownish, about 1/3 of an inch long, and winged — definitely not carpenter ants. They looked a lot like wasps, but their antennae were bent. I can send a photo (or post one to my web site and provide the URL) if desired. I’d like to find out what kind of ant they are and what I need to be concerned about (are they dangerous to my house, etc.). Any help you folks can give would be greatly appreciated. I am neither a scientist nor a photographer (though I do take pictures sometimes), but I am poet publishing a little online magazine called poet’sPicturebook, at http://marnescriptsmain.blogspot.com/. But I like to think I know good pictures. The ezine is actually a blog formatted as a magazine and accepts contributions of poetry, art and photography. The contributed poems and pictures are as much as possible of good quality, so I always strive to accompany poems with the best pictures there are. However the site is a non-revenue site, maintained by me for one year now without funding or compensation for contributions. For it’s yearend issue the ezine will publish a poem titled “Where Do Ants Go When They Die?” (by a veteran Philippine poet writing in English). I would very much like to use your Argentine Ant picture above (Linepithema humile or hum5 pic), with your permission and with full credits and links (in the contributor’s page). Should you permit, that would be wonderful. If you’re not inclined to allow me (you might want to visit the site first), I won’t use it. I would like to get in contact with Jo if i could please. Could you ask her to email me please. what is then a good ant? isn’t it so that the human species has imbalanced (with fertilizers, pestizides, etc.) the original homeplace of these insects and many other living species (including that of the human species itself) eliminating is not a solution – unfortunately the number of them is many, many times bigger and their intelligence not lesser than ours and they would survive – not us! I just read an article on Huffpo about how these ants have formed a sort of super colony around the world. In North Florida our bigger worry (as of now) is still the fire ant. Their sting is pretty bad. What would happen if these 2 types of ants met? What would happen if these 2 types of ants met? When Argentine ants meet fire ants, the fire ants disappear…at least they did in my 3 acre yard. No more fire ants (good) but uncontrollable Argentines requiring almost daily intervention. hi everyone? i am interesting ants? and wont bay a few tapes of them? i live in Ukraine? if some one wont help me ride on mail d.cherkasov@mail.ru i am looking Atta sexdens and others! Does anyone know if the Argentine Ant has made it to the Okavango Delta in Botswana yet?? Accédez au guide virtuel de strategie des casinos en ligne et apprenez les astuces et systèmes des professionnels pour convertir les avantages de la maison et les probabilités à la table du casino sur Internet. Thanks for sparing us the full gory details of your thesis, Alex, but taking the trouble to explain how to identify these critters. All I need now is a microscope, a pick and a lot of patience. I found them collected in a hummingbird feeder I recently put out.